Tap into digital technologies and explore the secrets of Lincoln’s past! Smartphones at the ready, you have the chance to be the first to walk the city’s new Digital Roman Trail, which is being launched on Saturday, May 17th – Lindum Colonia Day. If you are not technical, don’t worry printed ” copies can be picked up from the city’s Visitor Information Centre in Castle Hill. Copies cost just £1! The new walk has been devised by the Visit Lincoln Partnership and Lincoln BIG and it guides visitors along a route which takes in the upper Roman city and which also includes details of other Roman landmarks further south. The launch of the trail is just one aspect of a great weekend. May 17 and 18 will be bursting with Roman-linked activities, all designed to give you a flavour of what life in Lincoln was like 1,600 years ago, when it was known as Lindum Colonia. Watch out for Roman military patrols and battle skirmishes while out and about in the city! 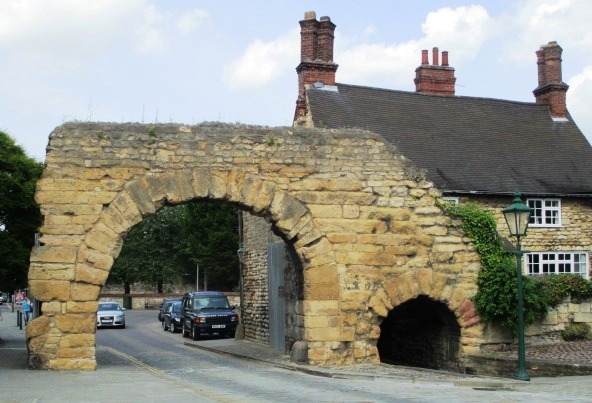 Lincoln’s famous Postern gate – part of Lincoln’s Roman South Wall which now lies under a bank – will also be open for guided tours throughout Saturday May 17th, from 10am to 3.30pm. Entry costs £1 per person. On the Saturday and Sunday you will also be able to visit a Roman Camp, which is being set up within Lincoln Castle. Why not take a walk into the St Mark’s Square area of Lincoln, where you can learn about how Roman artefacts make the journey from being buried thousands of years ago to being given pride of place in today’s museums. You will be able to see the conservators’ work, examine artefacts and have a go at making parts which can be used to repair broken objects. Don't forget to book your room at Cathedral View Guest House for the weekend here, before its too late! More details about Lindum Colonia Day can be found at: http://www.visitlincoln.com/whats-on/lindum-colonia-day.